I admired the serious calm anger of the pacifists at demonstrations. How they would walk right up to a line of riot police and then sit down, without flinching, without showing fear. At demonstrations they took to the streets and blocked traffic as if it was the most natural thing in the world. I admired their clarity and how their actions were consistent with their beliefs. I studied the history of non-violence. I read Gandhi, Dr. King, and Barbara Demming. Some of it rubbed off on me. I feel like I’ve been angry my whole life. When I’m out protesting, I have trouble holding onto two of the basic principles of non-violence: that non-violence seeks to defeat injustice not people, and that non-violence resists violence of the spirit as well as the body. I have to keep reminding myself that there is no point in hating, having contempt for, or humiliating people I disagree with. This includes people who are pro-Trump and anti-gay/anti-trans. It does not feel good to hate. It does not move my cause forward. It does not help them see me as an individual. 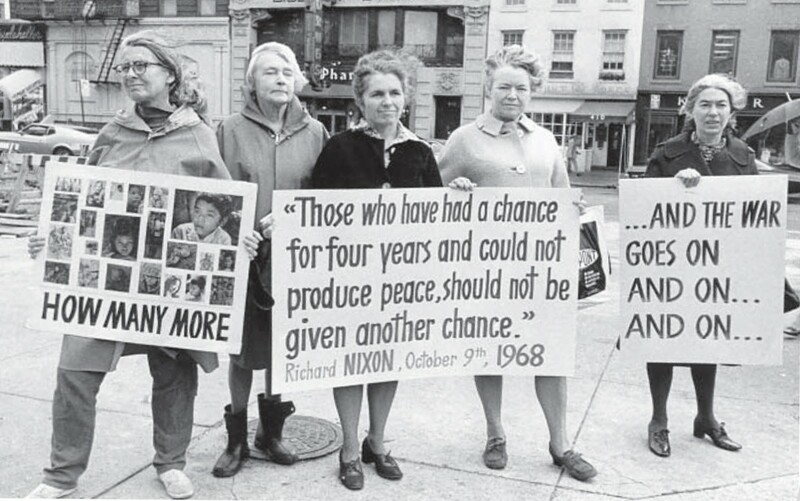 When Donna is at a demonstration, she often asks herself “What would Grace Paley do?” Donna was friends with Grace; they knew each other through the peace movement. I was initially intimidated by Grace because she was a famous writer, and because she looked like, and sounded like, a Jewish grandmother. She didn’t act like one. Grace spoke what was on her mind, but she did it without losing her temper. Grace talked, in a friendly manner, to everyone and anyone at a demonstration, including the police, counter-protestors, and hostile bystanders. She could turn shouting matches into conversations. If a man told Grace to “Go back to Russia!” she’d start off her reply with “My father was born in Russia, and came here for a better life…” Grace would find a way to talk to her adversary, at length. I’ve lost it at demonstrations when I was heckled by someone who disagreed with me. Each time it caught me by surprise. All it took was for them to tell me they hoped I die from AIDS, or to call me a f-ing dyke. If a man told me to “Go back to Russia!” I’d probably tell him to crawl back into his cave. Last week there were thirty of us protesting outside of Trump Tower and five pro-Trump counter-protesters approached us. They tried to provoke us by walking in front our group and blocking our signs with their signs. They were looking to start a fight. At first I resisted asking myself “What would Grace do?” I didn’t want to channel a Jewish grandmother, even if it was Grace, even if she was right. I didn’t want to do anything that might look too accommodating, but I also didn’t want our group to get into a fight with them. I introduced myself to their leader, and I politely, but firmly, asked them to move to the edge of our demonstration. I told them that we would respect their signs and message if they respected ours, and that there was enough room on the street for both groups. Part of me wanted to rip their signs out of their hands. Part of me wanted to call them Neanderthal Nazi’s. There was another part of me that wanted to see if I could get them to move by being neutral, or open. Denied an opportunity to fight, they acquiesced, and moved away, while the spirit of Grace watched over us. Librarians? Ouch. Hopefully the American librarian has changed with the times, but yes, there are still too many stereotypical ones in the profession. But that is off the point – congrats on keeping the spirit of Grace alive. Is she the reason you named your dog Gracie? Grace would have been proud of you! I really admire your courage and steadiness. I don’t think I could have been so neutral and persuasive. Thank you for this message of peace & positivity. You offer a good reminder to be mindful of the purpose of protest (or any other action), and to keep the temper under wraps. Thanks, also, for introducing me to Grace Paley. I’d not heard of her before.